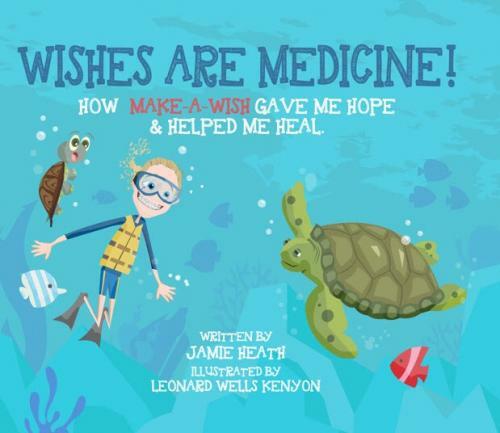 Wishes Are Medicine, written by Wish Kid Jamie Heath of Barre, VT, and illustrated by Leonard Kenyon of Arlington, VT, tells the story of Jamie's recovery from a brain aneurysm and how Make-A-Wish played an important role in her recovery. With bright, beautiful illustrations, Wishes Are Medicine follows along as Wish Kid Jamie, accompanied by her pet turtle Bob, learns not only to walk and read again, but regains hope and thrives in the face of her condition thanks to her wish to travel from her home in Barre to swim with sea turtles in Hawaii. Jamie recently completed her Junior year at Spaulding High School where, in addition to being an honor roll student, she served on the Student Council and Student Outreach Committee. In her free time she volunteers for the Friends of Stowe Adaptive Sports program, an organization that has provided invaluable support to her in achieving her athletic goals. Jamie is a Wish Ambassador for Make-A-Wish Vermont. She regularly gives speeches at Make-A-Wish events and has appeared in public service announcements on both TV and radio for the organization. Jamie lives with her mother in Barre, Vermont. She really, really loves turtles. Proceeds from the sale of Jamie's book will support wishes for Vermont's wish kids!